Do you know that most women love well-shaved men? And today we’re going to talk about the straight razor. Let’s go! 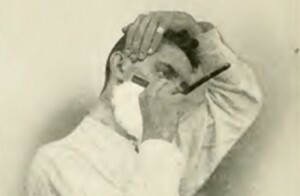 Until the 1950s, the straight razor was the most common razor used by men. This was until safety razors took to the stage. Nevertheless, some people continue to use a straight razor for all their shaving needs, while some are interested in trying them out. It takes some time to master the correct ways of shaving using a straight razor, and it can be dangerous too. If you never used it before continue reading to find out what a straight razor is, how to use it, and the pros and cons of using them. A straight razor is a type of a razor blade that can be folded up into its own handle. They are also commonly referred to as open razors and cut-throat razors. It needs to be handled carefully as the blade is exposed once out of its handle, and can cause deep cuts. To make sure you get a smooth and painless shave, you must use a lot of hot water before shaving. You could preferably take a bath or a shower in order to soften the bristles, along with opening up the pores of your skin. The next step is to thoroughly massage the shaving cream onto your face. Fingers will suffice, but a good shaving brush is preferable. You must not let the lather to dry out if you’re planning to use a straight razor to shave! Stretch the skin of your face as much as you can, and while holding the blade at an angle of approximately thirty degrees, gently begin your first stroke in the same direction as the growth of the hair. The angle is important to prevent getting any cuts. On completing the first shave, you can re-lather for the next shave, this time by going against the direction of your hair growth. This will ensure that you have a smooth shave. A straight razor gives, unarguably, a much smoother shave than any of today’s electric or safety razor types. It is much cheaper and will bring down the costs of your shaving considerably. This is because, after the initial investment, all you need to do is buy low-cost blades as the replacement. A straight razor can be quite dangerous if handled incorrectly. Use with caution. The razor requires additional time for its care. You will have to hone and strop the blade in order to maintain it. It takes time to get accustomed to. You will have slow shaves until you master the art of shaving with a straight razor. And here what I have for you is one of the best straight razor shaving video tutorials I’ve ever seen. Enjoy it! 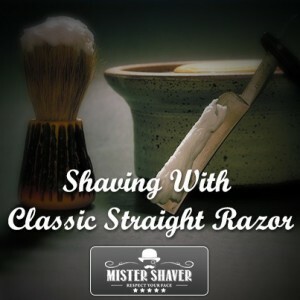 Have you tried shaving with a straight razor? What do you think about it? Tell your thoughts in comments below. Great article. Dovo’s are a great starter razor, just keep in mind that they may need to be honed a little prior to shave. In most case’s just stropping might get you by.